We all know putting a price on carbon is the only way the world will ever come to grips with its carbon addiction. The phony baloney “free market” tripe put out by the Koch Brothers and so-called conservatives has been proven over and over again to be nothing more than a lie to cover up the “heads we win, tails you lose” nature of capitalism in the modern world. If we don’t stop pumping carbon dioxide into the atmosphere, millions of species will disappear from the face of the Earth. Homo sapiens will surely be one of the species endangered, with potentially billions of future humans succumbing to the stress placed upon them by a warmer climate. The “government should not be picking winners and losers” mantra sounds sensible until you realize it is just an artificial way to justify extracting and burning every molecule of fossil fuel hidden beneath the Earth’s crust anywhere on the planet. Eventually, the price of fossil fuels will go up dramatically and Adam Smith’s “unseen hand” will lead the way to an energy transformation, but by then it will be too late for most life on Earth. The dirty little secret about coal and oil and natural gas is that they pay nothing for the harm they do. They are allowed to pump their sewage onto everybody else’s property and force others to clean up their mess. That’s messed up, isn’t it? In what universe is that even remotely fair? Economists call that situation an “untaxed externality” — something that has a cost that doesn’t get added in to the profit and loss calculation. In other words, it’s a free ride for someone. If humanity has any hope of not destroying the Earth, it must close that loophole. Call it a carbon tax, call it a carbon fee, call it a market adjustment, or call it an economic equalization policy, the cost of the damage done by extracting and burning fossil fuels must become part and parcel of the way the world produces the energy it needs to function normally. But Houston, we have a problem. If we just jack up the price of oil or gas or coal to where those fuels pay for the damage they do, ordinary people will be pushed into poverty, entire industries will collapse, and the whole world will become a giant economic dust bowl. The inevitable result will be a version of the “Yellow Vest” rebellion that has roiled France for the past 2 months. Is there a way to promote economic fairness without abandoning social justice? Yes, there is. The Canadian province of British Columbia crafted a revenue neutral carbon pricing plan back in 2008 and it is working reasonably well a decade later, according to Craig Axford writing on Medium. The key, according Axford, is that British Columbia started its carbon pricing program modestly, assessing a minimal fee of just $10 per ton. That amount went up $5 a ton per year until stabilizing at $30 a ton after 2012. As a result, the price of gasoline went up about 25 cents a gallon. The fee is now scheduled to increase to $50 a ton by 2021. In a 2014 study by Nicholas Rivers of the University of Ottawa and Brandon Schaufele of the University of Western Ontario, the authors report the plan included financial relief for those most directly affected by the higher cost of fossil fuels right from the very beginning. The latest study in 2015 shows the British Columbia plan is working. Despite the fact that the province is showing an increase in population and a more robust economic recovery from the 2008 financial crisis, greenhouse gas emissions have dropped about 9% and gasoline sales are down between 7% and 17%. Commercial demand for natural gas has plunged 67% since the initiation of the carbon fee. 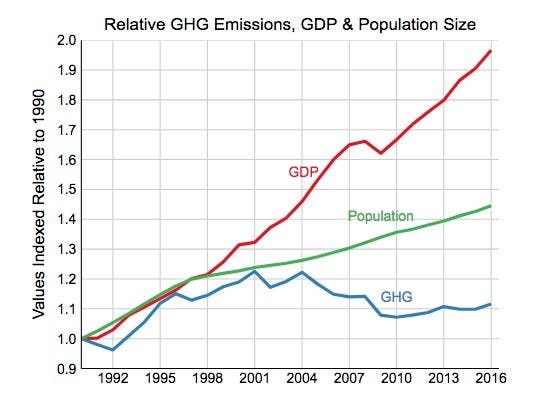 “It’s important to remember that even a revenue-neutral carbon tax can still function as a tax increase for a significant emitter of CO2. The government hasn’t committed to making sure no one pays more in taxes. Only that all the money generated by the tax gets returned to the public in one way or another. The point, Axford says, is that Emmanuel Macron and the French government dropped its proposed gasoline tax increase on the French people without explaining how it would benefit them. Then it adopted a Marie Antoinette-like “let them eat cake” attitude that infuriated the populace. President Rump, of course, will learn nothing from the BC experiment. He is too busy looking in the mirror and telling himself how wonderful he is. 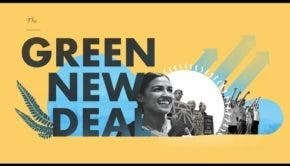 But Democrats could learn some valuable lessons as they try to craft a Green New Deal that will appeal to mainstream voters. Even though climate change is going to affect the majority of humanity, the current masters of the universe holding the US government hostage could care less about social justice. The Democrats must offer voters a realistic plan that is rational and compassionate. If America wants to be a great nation, it needs to lead and the time to start doing so is now. Putting an appropriate price on carbon in a way that is revenue neutral would be an excellent way to begin.